A trip to the depths of an ancient ocean, the secrets of life-giving and dead water, amazing ancient architecture, a night in a tent next to a UFO: all this and more can be found in the Ural Mountains, which stretches for 2,500 kilometers from the Arctic Ocean to Kazakhstan. Tobolsk (1,860 kilometers from Moscow) is one of the oldest cities in Siberia and formerly was a place of exile for many writers and public figures. From the 17th century to the beginning of the 20th century Tobolsk was known as the spiritual center of Siberia, thus it is often referred to as the "Angel of Siberia." 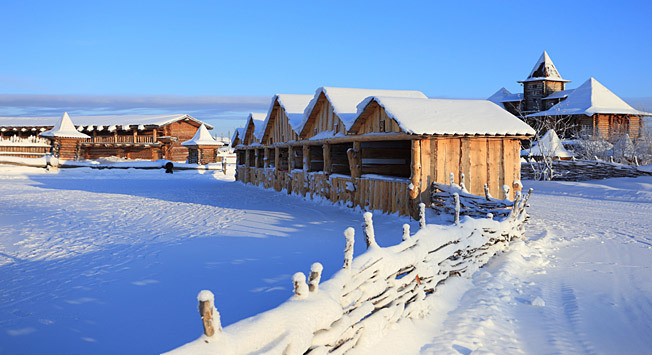 At the tourist complex Abalak, which has been built according to the tradition of Siberian wooden architecture, you can visit the Siberian “Ded Moroz,” the Russian version of Santa Claus. His residence is located in a tall wooden “terem” (a type of palace in ancient Russia), a style inspired by Russian fairytales. Next to it, in an “izba” (hut) standing on chicken feet, lives the hospitable “Baba Yaga” (witch), who offers all visitors “pirogi” (pastries) and “bliny” (Russian pancakes). On Ded Moroz’s property there is a zoo where visitors can feed animals and ride reindeer and horses. It is worth spending a day walking around Tobolsk checking out its amazing architecture and Kremlin. Visit the Sofiisko-Uspensky Cathedral, the Gostiny Dvor shopping arcade, the prison castle and the Treasury Chamber (Swedish Chamber), which was built in the 18th century by Swedish prisoners. Conclude with a visit to the old Zavalny Cemetery, where many interesting graves have survived, and a monument to Yermak, who led the Russian conquest of Siberia. Gifts: Tobolsk is known for its hand-carved mammoth bones and elk horns. Writing utensils, knives, chess sets and women’s jewelry made of hand-carved bones have been made by Tobolsk craftsmen for centuries. How to get there: Tobolsk is located in Tyumen Region, approximately 250 kilometers northeast from the capital, Tyumen. From Tyumen take a bus or train. Where to stay: There are many types of accommodation in Tobolsk ranging from budget hostels to five-star hotels. The following link features a comprehensive list. Taganay (1,643 kilometers from Moscow) is a beautiful park where whole ecosystems have survived intact: mountain tundra, meadows and ancient forests. Located in the southern Urals, near the town of Zlatoust, Taganay is famous for its stories of UFO and Sasquatch sightings. There are 13 natural monuments in the park, including the Bely Klyuch spring renowned for its extremely pure cold water. You can go hiking along a path that stretches nearly 50 kilometers. Climb to the top of the Two-headed Hill (Dvuglavaya Sopka) and see the sunset with the Ural Mountains in the background. From there climb to the top of the Mitkiny rocks and reach the Otkliknaya Greben mountain (Answering Crest), whose face can echo human voices up to five times. Gifts: In Zlatoust local gunsmiths produce unique knives made of stainless Damascus steel as well as steel engravings. How to get there: The park is located near the town of Zlatoust in Chelyabinsk Region 160 kilometers west of Chelyabinsk. It is easily accessible by rail from Chelyabinsk with about a dozen daily trains. Where to stay: There are many cabins for tourists (from 1,500 rubles or about $29 per day) but you can also set up your own tent. Visimo-Utkinsk (2,028 kilometers from Moscow) is a picturesque village in the middle of the Ural’s thick forests near the city of Nizhny Tagil. The unique Russky Tyazhelovoz horse-breeding farm, located here, breeds a stock of beautiful, strong and vigorous high-jump horses. Ride horses on breath-taking paths and see the picturesque rivers, mountains and unspoiled taiga forests. Rides can last from a couple of hours to a few days and it is possible to spend the night in hunters’ cabins. Enjoying a steam in a Russian banya after a horse ride is recommended. Nearby Nizhny Tagil, an industrial city of about 360,000 hosts a unique factory museum, which is part of the Nizhny Tagil Museum of Mining of the Middle Ural. The items exposed, dating back to the 18th and 19th centuries, tell the story of how the Ural region became one of the world’s largest mining areas. The Museum of Armored Machinery features an exhibition of the Ural Wagon Factory, the biggest producer of tanks in Russia. If tours of Nizhny Tagil are desired (they aren't cheap), they can be ordered. Gifts: In Nizhny Tagil they make various kinds of products made of gems, as well as lacquer-painted trays. How to get there: Visimo-Utkinsk is located about 65 kilometers southeast of Nizhny Tagil in Sverdlovsk Region. Where to stay: Stay right on the farm at Russky Tyazhelovoz from 500 rubles per day (just under $10). E-mail for more information. At one time what is today the Republic of Bashkortostan (1,169 kilometers from Moscow), was covered by an ocean. Today a reminder of that era is one of the most ancient mountain groups on the planet, Bashkirskie Shikhany, which millions of years ago was a coral reef at the bottom of the ancient Permian Sea. Bashkirskie Shikhany are not far from the city of Sterlitamak (1,297 kilometres from Moscow) on the River Belaya. The latter is Bashkiria’s main waterway, and its banks are full of tourist resorts and sanatoria. Tourists come here to enjoy nature, relax in ecologically clean areas and improve their health with mineral waters, mud baths, natural treatments and even “kumysotherapy” (kumys is a traditional drink of nomadic peoples made from mare milk). Of the four original Shikhany, which stretched over a 20-kilometer chain, only three are left. The highest one is the Tora-Tau. In ancient times it was considered a sacred mountain that could free the soul of people from bad thoughts. Today at the foot of the Tora-Tau one can still see the ruins of a prison for women, one of the islands of the Gulag Archipelago. Gifts: Bashkortostan knows how to promote itself and souvenirs abound: Bashkir honey, “Dikii Myod” (wild honey) vodka, Bashkir matreshka dolls and “chak-chak,” a Bashkir national dish made from dough and honey all make good gifts. How to get there: Bashkirskie Shikhany are all located just to the west of Sterlitamak in the Republic of Baskhortostan. Sterlitamak can be reached by rail. The nearest airport is in Ufa, about 100 kilometers away. Where to stay: There are many hotels in Sterlitamak. A comprehensive list can be found here. It is also possible to stay closer to nature at tourist complex Shikhany, which features basic hotel accommodations. Another pearl of Bashkortostan is the village of Krasnousolsk (1,300 kilometers from Moscow), renowned for its curative hot water springs. In the surrounding area there are plenty of sanatoria and spa resorts. These resorts are known for using salted hydrosulphuric water therapy and mineral-rich black mud baths for treatment. Many who come to Krasnoulsk try to bathe in springs with allegedly life-giving, dead and rejuvenating water, as all three kinds of water appear in Russian fairytales. How to get there: Krasnousolsk is located about 130 kilometers south of Ufa. Daily buses run from the Yuzhny bus station in Ufa or from the Ufa univermag (department store). See the sanatorium’s website below for more information.